Because I have so much free time (NOT! ), I've turned copious amounts of it into a new plugin for Adobe Lightroom that provides the simple but useful function of telling you what focal lengths your images were shot at. 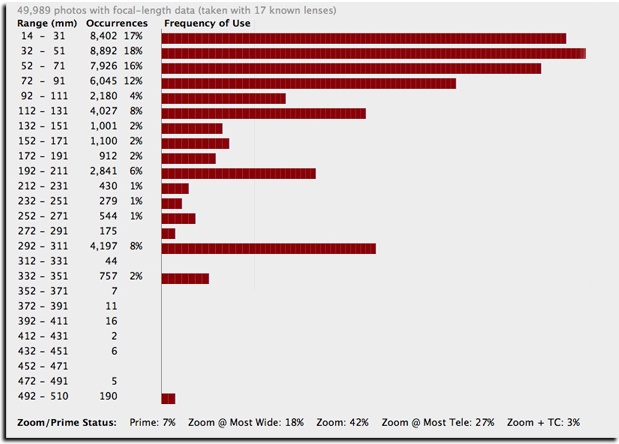 It's like a stripped down version of ExposurePlot, but integrated into the Lightroom catalog. Currently the plugin does only 35mm-equivalent focal-length plotting, but I've named it the more generic “data plot” to allow for future expansion. You can see the version history and download the latest at the plugin's home page. I have something similar working: Just a few perl scripts picking at the EXIF data. I even used it to reason with my wife why I needed ‘another’ lens. I wouldn’t use your plot though. I heavily use the 50mm prime. That would reduce all other focal lengths to near nothing. So my plots are only for the zoom lenses. I also have lists and plots saying which Lens I used most over time that also shows when every lens was added to (or removed from) my kit. Very cool. Can’t wait to try it out. Any plans on expanding it to aperture? …By that I mean the setting, not the program. That’s nifty (but i’m not a Lightroom user). It may be more useful to have the focal length buckets in a geometric scale. In other words, N to N*1.2 would make more sense than N to N+19.